Shawnee’s Kunmi Ojo hits a return during Saturday’s Wapakoneta Invitational. Lima Central Catholic’s Madie Brinkman returns a shot during Saturday’s Wapakoneta Invitational. WAPAKONETA — Shawnee won all three doubles championship Saturday on its way to winning the five team Wapakoneta Girls Tennis Invitational. Katie Clark and Sanjana Rajasekaran won A Doubles, Alotus Wei and Lade Onamusi were B Doubles champs and Ella Atkinson and Dele Ojo were first in C Doubles. 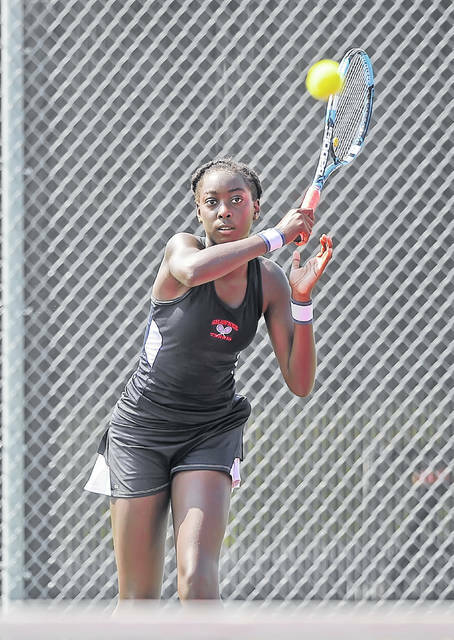 The Indians’ Kunmi Ojo was third in singles. Olivia Kesner won the singles competition for second place Lima Central Catholic. 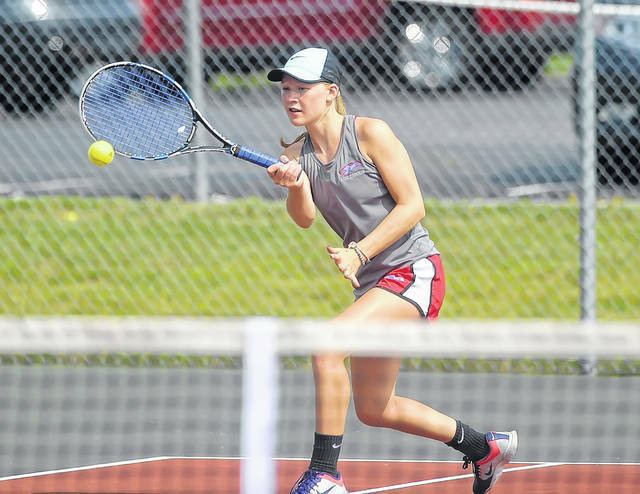 The Thunderbirds’ Anna Janowski and Madie Brinkman were second in A Doubles. The duos of Madison Snider and Casey Minnig (A Doubles), Ellie Schroyer and Alyssa Good (B Doubles) and Makenzie Schroeder and Jessica Davis (C Doubles) each finished third in their respective divisions for fourth-place Wapak. https://www.limaohio.com/wp-content/uploads/sites/54/2018/08/web1_wapak-invite-RP-007.jpgLima Central Catholic’s Madie Brinkman returns a shot during Saturday’s Wapakoneta Invitational. Lima Central Catholic’s Madie Brinkman returns a shot during Saturday’s Wapakoneta Invitational. This entry was tagged limacentralcatholic, shawnee, Wapakoneta. Bookmark the permalink.